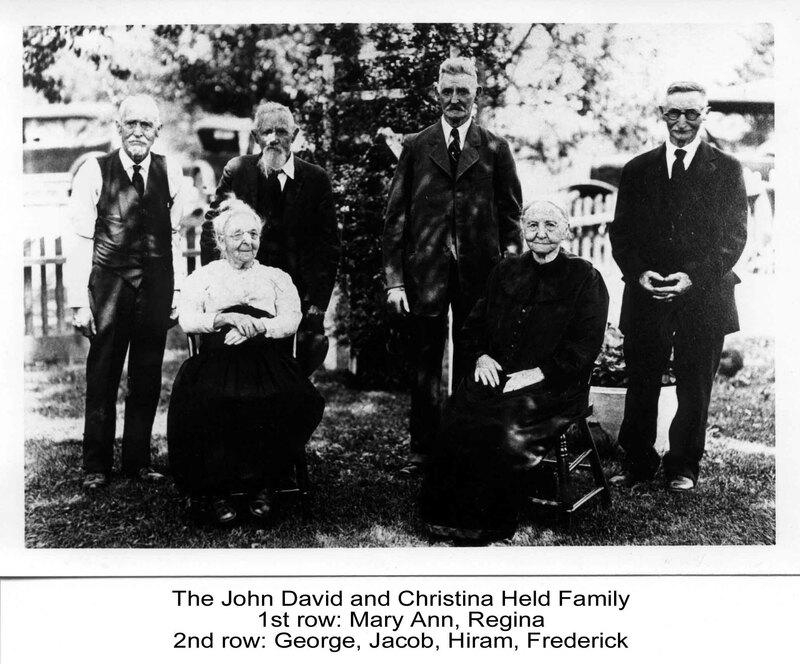 John David and Christina Held were the original immigrants of our Held family. John David grew up in Aurich about 10 miles NW of Stuttgart, Germany. Christina was raised in nearby in Mönsheim, which is on the edge of the famous Black Forest. The Helds have a long tradition of over 300 years in that general area. They married on February 26, 1843, and resided in Mönsheim where they had six children. In the summer of 1856, they sailed to the United States of America for economic reasons. The Held family had first choice for space on the ship because they had the largest family. Two other related families, Reichenbachs and Blyholders, had immigrated earlier. It took forty-four days to cross the Atlantic Ocean on the bark Genesee. Outside of New York harbor the ship stuck on a sandbar at Little Egg Harbor. The first tugboat that went out to pull them off the sandbar asked too large a fee. They did not have enough money. After remaining on the sandbar four days they pooled enough of their possessions to make up the difference. Then finding there was whiskey on board they would not work until they shared their drink. Finally the ship was pulled off the sandbar and landed safely at New York. John David was a certified tailor by trade and brought his own sewing machine packed in a trunk of clothes on the boat from Germany. At that time to be certified in tailoring, one had to make a suit of clothes for a stranger without measuring him. If the suit fit perfectly he was given certification. The first suit John David made in Pennsylvania was for their pastor at St. Michael's Evangelical Lutheran Church at Brick Church, PA. He charged fifteen dollars for the suit. Frederick walked to the manse to deliver the suit. Speaking only German, the Held family found it difficult to converse with English-speaking neighbors. The children learned English quickly and helped their parents. John David relied on his son Frederick to translate conversations while he measured men for suits. They walked to Greensburg to get orders and deliver suits. None of his sons cared to learn the tailoring trade. Frederick at age thirteen led a cow from Cherry Run to Mosgrove, a distance of seventeen miles. The cow was a wedding gift from John David to his son, George. As he was passing the Kittanning railroad station someone called to Frederick it had just come over the telegraph that President Lincoln had been shot. Their children grew older and went to find work. George moved to Kittanning to work. Regina married Joseph Frantz and moved to Kittanning, also. Jacob farmed a large farm at Kelly Station. Frederick built a house on the next farm. Louisa married Samuel Kunkle and moved to the Shay area. Hiram worked in the Apollo steel mill. Mary Ann was a dwarf and stayed at home. John David died in 1882 and was buried beside his two children in St. Michael's Luthern Church Cemetery at Brick Church, Armstrong County, PA. Nineteen years later Christina Lydia died and was buried beside him. Mary Ann went to live with her niece Bretha Swank. They were brave and courageous pioneers.